The reform on opening the markets of crude oil and of petroleum products is a supporting point or lever of the whole petroleum industry reform, which involves fewer aspects, and is with less rigid comparing with the reform that touches the vested interest of the upstream industries of the oil monopoly enterprises, such as oil extraction and petroleum refining,while would get twice the result with half the effort. On the one hand, the reform can obtain most of benefits quickly from the breakup of monopoly, namely it can eliminate the losses of consumers caused by monopolistic high prices, and will eliminate the net loss of social welfare caused by the limitation on enterprise entrance. 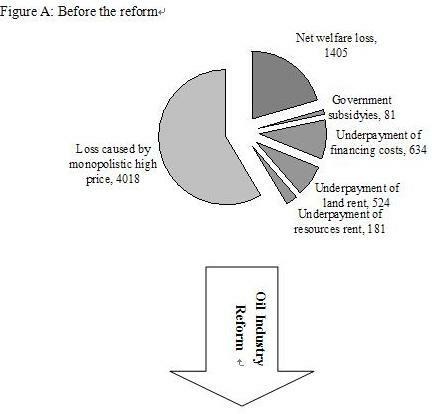 According to welfare loss caused by the monopoly in 2011, the reform would obtain 79% or four-fifths of static effects of the petroleum industry reform (as shown in the figure below), in addition, it also would increase a total sales volume of above RMB 300 billion per year due to local oil refining enterprises to increase the utilization of their capacity. On the other hand, the market-oriented reform in the trading field will have significant effect on the upstream production field and will promote the final completion of the oil system reform inChina. Thus, it is a reform to achieve quite a number of benefits with low costs. The economic characteristics of the oil-gas industry determine that the system of the oil-gas industry should mainly depend on the market institutions, supplemented by proper government interventions, e.g. levying fuel oil taxes, adopting short-term intervention for large price fluctuation, commandeering oil resources and products in time of war, and establishing resource reserve in time of peace. The current oil industry system ofChinabasically reflects the three aspects: the state-owned enterprise, price regulation and entrance restriction. Thus, the oil industry ofChinahas a high degree of monopoly, e.g. two to three monopoly enterprises have integrated monopoly in exploration, mining, refining, wholesale, retail, even import and exports. The monopoly in the oil-gas industry is an administrative monopoly, which is such a kind of monopoly established by administrative departments through issuing administrative documents. These administrative documents are not issued through due legal procedure, but they determine the affairs influencing the vital interests of Chinese people, so that they are illegal. The current oil monopoly system and corresponding monopolistic behaviors of oil monopoly enterprises violate the constitutional principle of socialist market economy and the Anti-Monopoly Law. The reason as basis for administrative documents to establish oil monopoly right is not economically rational. The oil monopoly system has brought about a great efficiency loss in the whole society. 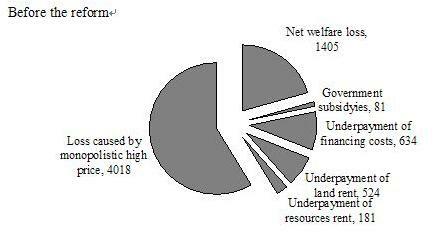 It is estimated the welfare loss in the oil industry reached as high as RMB 3.477 billion from 2001 to 2011. The system also distorts the income distribution and violates the principle of fairness. 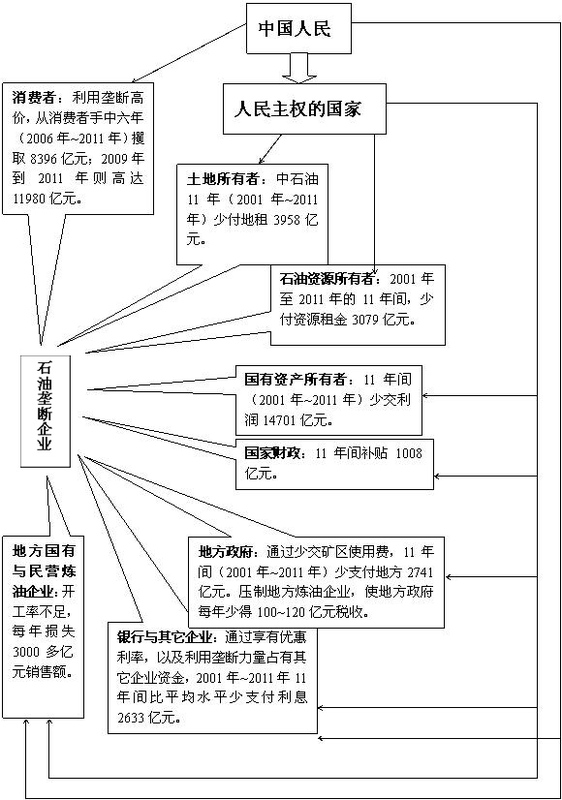 From 2000 to 2011, three monopoly oil companies lacked to payed profit of RMB 1470.1 billion. But in their income level, these companies are far higher than social average level, e.g. the per capita salary of the China National Offshore Oil Corporation in 2010 was about RMB 340,000, about 10 times of social average level. The system violates the market rule and makes oil monopoly enterprises become unfair competitors. 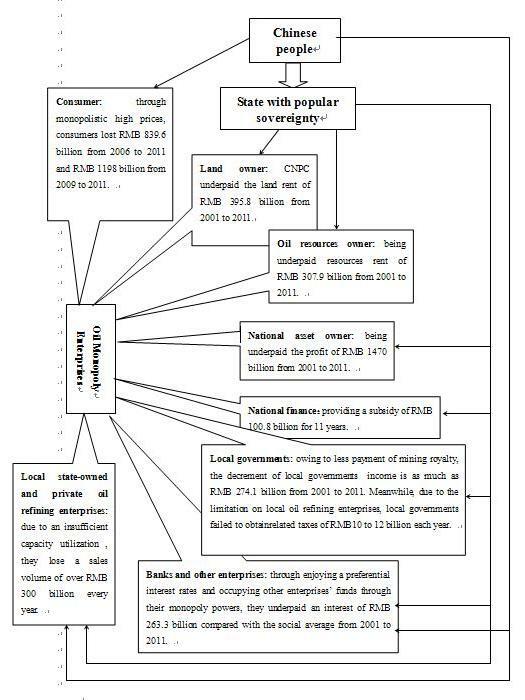 From 2001 to 2011, CNPC underpaid land rent of RMB 395.8 billion, while oil enterprises underpaid resource rent of about RMB 307.9 billion and financing cost of about RMB 287.8 billion. 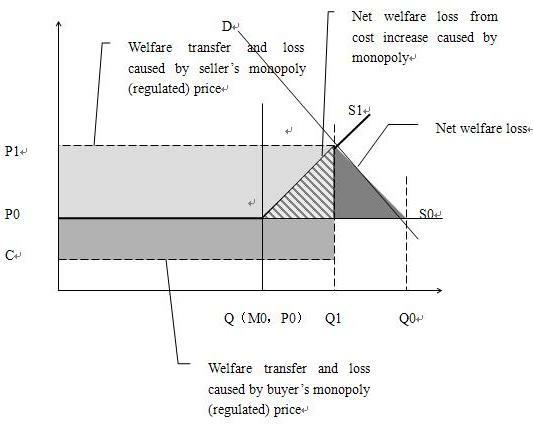 The system makes an originally competitive market become a monopoly market, consequently it makes the market-based pricing system ineffective, so that the government regulation-based pricing mechanism is adopted. However, such a pricing mechanism is inefficient, causing the price it determines to deviate from the price determined by the market and will undoubtedly cause welfare loss. Meanwhile, it makes monopolists reduce their production and supply when the price is low but overproduce or oversupply when the price is high. With the quantities of production and stock in turn influence the price. The system also directly damages other competitors including private enterprises in the following aspects: (1) to prohibit entrance, or to drive those enterprises in the industry out of oil extraction and sales realms; (2) to impose restrictions or discriminations on competitive enterprises that have already entered the oil industry; (3) to cooperate with local governments and rejects competitors through administrative powers; (4) to directly violate the property rights of private enterprises, etc. The regulation on crude oil import has resulted in serious insufficiency of capacity utilization of other oil refining enterprises in addition to oil monopoly enterprises, so that a total loss of sales volume reached about RMB 300 billion every year. Because the quality standard of petroleum products of China is lower than other major countries, while the quality standard of petroleum products of Beijing is higher than the national standard and is close to European standard (see the figure below), We here have conducted a comparison between the adjusted price of petroleum products in Beijing and the average level of other main countries. From 2006 to 2011, the losses of consumers caused by the high monopolistic (regulated) price were as high as RMB 839.6 billion; from 2009 to 2011, the monopolistic (regulated) price of petroleum products in China (before tax) was about 31% higher than average price of main countries, so the losses of consumers reached as high as RMB 1198 billion. The system also damages national security and influences social stability. It provides the conditions and excuse for oil monopoly enterprises to create “Gasoline Shortages”, results in the tension and opposition between the central government and local governments, and damages the interests of central and western regions and minorities areas. Meanwhile, monopoly enterprises blackmail the government at a crucial time. Finally, the system itself violates the framework of Chinese constitutionalism. Monopoly enterprises arrogate to use public power and impliment administrative power or quasi-administrative power, while administrative departments arrogate to have legislative power and abuse legal enforcement power in order to carry out the monopoly and regulation described in administrative documents. Therefore, it is a system with significant problems, which should be reformed radically. The reform has constitutionality, validity and economic rationality. 8、The government should impose limited regulations only in special fields at specific times. 8、To stop the price regulation. The reform on opening the markets of crude oil and of petroleum products is a supporting point or lever of the whole petroleum industry reform, which involves fewer aspects,and is with less rigid comparing with the reform that touches the vested interest of the upstream industries of the oil monopoly enterprises, such as oil extraction and petroleum refining, ,while would get twice the result with half the effort. On the one hand, the reform can obtain most of benefits quickly from the breakup of monopoly, namely it can eliminate the losses of consumers caused by monopolistic high prices, and will eliminate the net loss of social welfare caused by the limitation on enterprise entrance. The price of petroleum products will lower to the international level of the petroleum products with the same quality, which will benefit consumers. 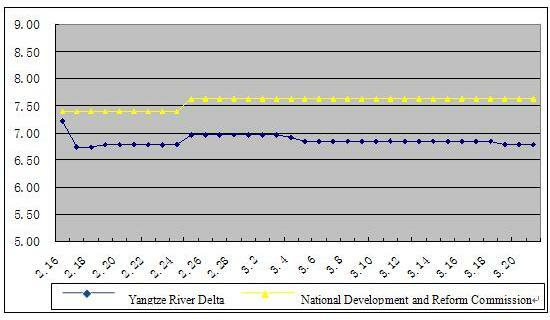 According to the data during 2009 to 2011, the prices of both diesel and gasoline inChinacould have been reduced by about 31%. So if the consumption is the same with 2011, consumers could pay less RMB 401.8 billion each year. 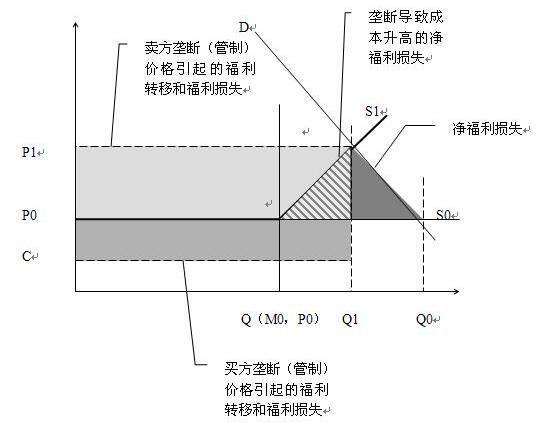 Even according to the price of petroleum products in the trading center beyond the current monopoly system ofChina, the price will also decrease after the markets of crude oil and of petroleum products are opened. It can be seen from the figure below that the price of 93# oil in the trading center of the Yangtze River Delta is about 13% lower than the regulated price by the National Development and Reform Commission. 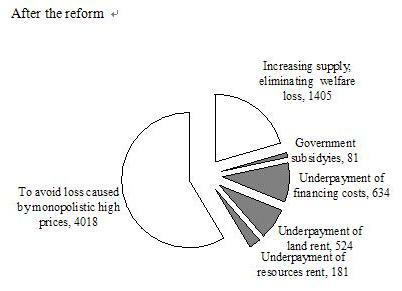 According to welfare loss caused by the monopoly in 2011, the reform will obtain 79% or four-fifths of static effects of petroleum industry reform (as shown in the table below), moreover, it will increase a total sales volume of above RMB 300 billion every year due to the increase of the capacity utilization of local oil refining enterprises. On the other hand, the market-oriented reform in the trading field will have significant effect on the upstream production field and will promote the final completion of the oil industry reform inChina. Thus, it is a reform to achieve quite number of benefits with low costs. 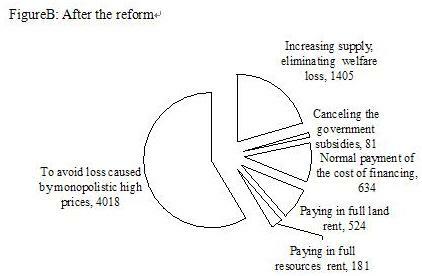 The analysis on the reform motivation structure indicates that most of people inChinawill support the oil industry reform. Since the monopoly is unpopular and the current oil monopoly system lacks constitutionality and justice, the governing party and the central government have the desire to reform, meanwhile, consumers and private enterprises are asking for a reform. Besides that, other central enterprises, local state-owned enterprises and local governments all support the reform. Only those administrative departments connected to the oil monopoly system and the managements and employees of oil monopoly enterprises may oppose the reform, but most of them still support the reform. When we select the scheme for the reform on opening the markets of crude oil and of petroleum products, we should choose a way with the lowest cost. （5）Transactions of planned rights: for all oil monopoly enterprises, the government can abolish the price regulation on the selling of petroleum products to exchange their agreement on opening the markets of crude oil and petroleum products. The reform inChinahas proved that when state-owned enterprises can’t absorb so many workers and even bring about large quantities of unemployed workers, non state-owned enterprises have become the main force in providing job opportunities. For example, from 2008 to 2011, among all new employments, non state-owned enterprises provided 96% of employments (according to the data from the State Statistics Bureau). Therefore, if the market-oriented reform can be successful, it will arouse the prosperity of non state-owned enterprises and create numerous job opportunities, which will be certainly more than the decrease of job opportunities of state-owned enterprises. Because the oil reserve-production ratio rises to 55, "Shale revolution" will lead to strategic growth of oil and natural gas supply, and natural gas will become the dominant energy in the new period;in addition, the growth rate of economies would slow down in China and India; the supply and demand relations will become relatively loose in the world oil markets, which is conducive to the reform of opening crude oil and refined oil markets.